Hello and happy Tuesday. It's time for another challenge at CASology. 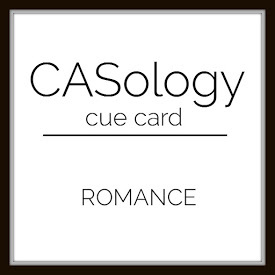 This week, our cue word is ROMANCE. What a perfect cue word for today. Happy Valentine's Day to all my friends. I found a tutorial on Jennifer McGuire's blog and I used it to make this Die Cut Gate Fold Card. I used a swirly heart die from Simon Says that I found in my stash, and some text texture for the sides of the gate. My sentiment is on vellum, which can be slipped off to open the card. Now it's your turn. How does ROMANCE inspire you? I hope you play along this week. Please remember to keep it Clean and Simple. We are sponsored this week by Uniko. Our Guest Designer is Skye. Beautiful gate fold card and I love the detail of your swirly heart! Great idea to add texture to the sides and vellum for your sentiment, too! Such a pretty card, Joyce! Oh, what a gorgeous gate-fold card, Joyce! The vellum is perfect, keeps the clean, white CAS card so clean. Love this! That heart is so intricate and lovely, Joyce. The vellum belly band is the perfect accent. I agree with the others, the vellum adds a fresh crisp look to your CAS design! Pretty card Joyce! What a great idea to make a gatefold using the heart die and the vellum band, Joyce!!!! Love that swirly heart and the dry embossing on the front!!! Wonderful CAS look!!!! Oh wow as always you are so inspiring! your card is stunning! Love the way you can remove the sentiment! This is gorgeous! Such a gorgeous, romantic card, Joyce! Perfect heart die cut to feature in a gate fold card. Beautifully simple! Love the added vellum belly band! So beautiful...love the way you folded your card and that beautiful belly band is so perfect with your gorgeous red heart. Hope you and Peter had a nice Valentine's Day! Joyce I love the way your card opens and the vellum belly band adds such a touch of elegance! Beautiful card design and the vellum is perfect! I miss crafting but have enjoyed a Sunday organ concert at Balboa Park, the USS Midway and a full day today on Coronado! What a beautiful place to live! I saw the video too and couldn't wait to make a card.......that didn't happen yet. Wow this one is stunning!!!! !